Click here to view the recap of the A-flight of this morning’s prelims. 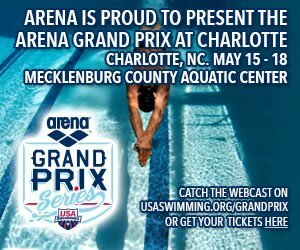 Today is all about Katinka Hosszu, the Hungarian Olympian that has made her presence known here in Charlotte this weekend. After winning the 200 freestyle and the 400 IM last night, she comes back tonight as the top seed in the 200 butterfly, 100 backstroke, and 400 freestyle. Katinka Hosszu had the lead right off the start and ran away from the field, making it look easy. She dropped a little bit of time from her morning swim to win the event with a 2:09.66. The real race ended up being for second place. Becca Mann pulled ahead from Kate Mills to finish second with a 2:11.61. Mills and Megan Kingsley finished 3rd and 4th at 2:12.95 and 2:12.97, respectively. Andreina Pinto dropped a little over a second to move into 5th place with a 2:13.05 and Courtney Weaver dropped a half a second to finish 6th. Emma Nunn and Meredith Hoover were 7th and 8th. Katarine Savard won the B-final of the women’s 200 butterfly with a time of 2:10.91. She dropped close to four seconds and would have finished second had she qualified for the A-final in the morning. It was a fairly close race through the first 50 of the men’s 200 butterfly. Dylan Bosch, the NCAA champion and SCY American record holder in this race, had the lead at the 100. In the final 50, Andrew Seliskar ran down Bosch to win in the final 20 meters. Seliskar’s final time was 1:57.40, and he finished almost a second ahead of Dylan Bosch. Bosch touched in second at 1:58.34. Tom Luchsinger managed to get into the wall for third place with a 1:58.77. Chase Kalisz finished fourth as the final swimmer to break 2 minutes in this event with a 1:59.27. Thiago Pereira dropped more than three seconds to win the B-final of the men’s 200 butterfly with a final time of 1:59.73. After missing her heat this morning and qualifying from the B-flight during prelims, Ariana Vanderpool-Wallace won the 50 freestyle with the eighth fastest time in the world this year at 24.65. Her SwimMAC teammate, Madison Kennedy finished second at 24.78. Jessica Hardy was third at 25.46, and Ivy Martin, the swimmer from Wisconsin, finished fourth at 25.53. Faith Johnson and Amanda Weir finsihed 5th and 6th, both touching the wall under the 26 second mark. Katie Meili dropped .63 seconds to win the B-final of the women’s 50 freestyle. 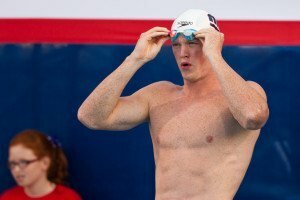 Josh Schneider stepped up to win the 50 freestyle, swimming a 22.17, which ties him for 19th in the world this year. Bruno Fratus reached in for second place at 22.27, followed by Kristian Gkolomeev at 22.38. Anthony Ervin and Cullen Jones both dropped a few tenths from their morning swims to finish 4th and 5th at 22.49 and 22.81, respectively. Ali Khalafalla was the only other swimmer to break 23, finishing in 6th at 22.93. Paul Powers won the B-final of the men’s 50 freestyle with a time of 23.18. Less than 30 minutes after winning the 200 butterfly, Katinka Hosszu powered through the back half of the 100 backstroke to win the race with the fourth fastest time in the world this year, 59.64. Kathleen Baker put some pressure on her, and was actually leading the field at the 50. She dropped .65 to finish second 1:01.39. Ali Deloof was a little off her morning swim, but still had enough to finish third at 1:01.83. Megan Romano managed to dip under 1:02 for fourth place with a time of 1:01.91. Fernanda Gonzalez, the winner of this event in Mesa, won the B-final of the women’s 100 backstroke with a 1:02.49. It was fairly close at the turn, but David Plummer had the lead with his 26.06 split. In the final 15 meters, Akrady Vyatchanin pulled ahead, out-touching Plummer to win the men’s 100 backstroke at 53.81. Plummer finished just behind him at 53.86. Junya Koga looked good through the 50, but faded slightly in the back half. He won the 50 backstroke yesterday, and finished third in this event today with a 54.93. Eugene Godsoe swam to fourth place in 55.04, and Charlie Boldison was fifth at 55.24. Drew teDuits won the B-final of the men’s 100 backstroke with a time of 55.60. Katinka Hosszu has already won her first two events, and you can tell she is really going after this swim. This 400 freestyle is less than 20 minutes after her second race of the evening; less than an hour since her first race. Leah Smith lead through the 200, and is looking great through the middle portion of this swim. Hosszu fell off with 100 to go. Allison Schmitt really went after it, looking the best I’ve seen her in a while. She ran away by herself in lane 7, winning the event with a time of 4:08.65. Gillian Ryan was able to run down Leah Smith to finish second at 4:09.10 with an aggressive final 100. Smith finished third at 4:09.13. Lotte Friis dropped close to three seconds to finish fourth at 4:10.02. We could say that Katinka Hosszu fell off, but she was only two seconds off her time from this morning, which is pretty impressive for her third race in less than an hour. 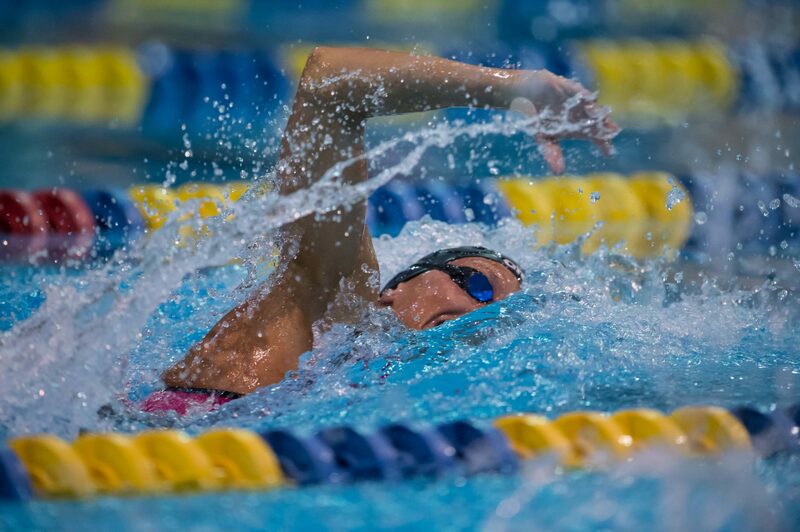 Hannah Moore won the B-final of the women’s 400 freestyle with a time of 4:13.33. Conor Dwyer took his first 100 out very aggressivlly. He was just able to watch his training partner win the b-final with a 3:51. Dwyer powered throught the first 200 in 1:52.9. Dwyer may have been out strong, but Connor Jaeger went HAM in the final 200 meters, running down Dwyer to win the race with a 3:48.89! Dwyer finished second with a 3:50.23. Michael Klueh dropped close to three seconds with a 3:52.40 to finish third. Matias Koski and Anders Nielsen were 4th and 5th at 3:53.52 and 3:53.76, respectively. 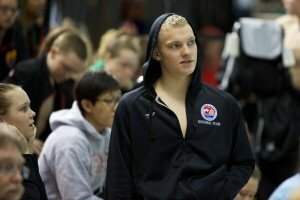 Matt McLean dropped almost nine seconds to swim an 8:51.49, winning the B-final of the men’s 400 freestyle. Micah Lawrence made it look easy, pulling away from the field to win the women’s 200 breaststroke with a time of 2:24.68. That time will leave her with the 11th fastest time in the world this year. Melanie Margalis finished second at 2:28.39, while Emily McClellan took third place with a 2:29.12. Molly Hannis snagged fourth place with a 2:29.30. Annie Zhu was fifth at 2:31.30 and Lilly King finished 6th at 2:33.83. Abigail Fisher won the B-final of the women’s 200 breaststroke with her time of 2:34.91. Mike Alexanderov was leading at the 100 with a 1:04.1, followed closely by Lewis Coleman. Anton McKee pulled ahead at the 150 and was fending off Chase Kalisz and Mike Alexanderov through the final 50. Anton Mckee won the event with a 2:13.06. Mike Alexanderov got his hand on the wall for second at 2:13.92 and Chase Kalisz finished third at 2:14.34. Lewis Coleman finished fourth with a 2:15.42 and Thomas Dahlia was fifth at 2:15.43. Brad Craig won the B-final of the men’s 200 breaststroke with his time of 2:18.46. 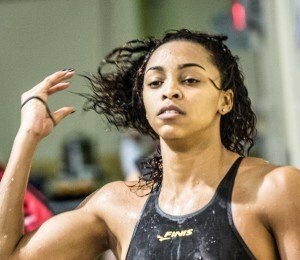 Ariana Vanderpool-Wallace showing off her sprint speed won the women’s 50 butterfly with a 26.28, the 11th fastest time in the world this year. Kelsi Worrell reached in for second at 26.56, just ahead of Kristel Vourna with a 26.64. Claire Donahue and Katerine Savard were 4th and 5th at 26.67 and 26.82. Sveta Khakhlova was the only other swimmer under 27, finishing in 6th at 26.95. Aliena Schmidtke won the B-final with a 27.32. Albert Subirats dropped .3 seconds to win the event with a time of 24.00. Joseph Schooling finished second at 24.11, just ahead of Kristian Gkolomeev at 24.15. Eugene Godsoe cut a little bit of time to finish 4th at 24.25. Sean Fletcher won the B-final with a time of 24.42. I think we are going to watch a Hosszu show tonight! Perhaps one of the NBAC girls will beat her in the 400 free. I’ve learned that Chloe Sutton has been injured. According to a swimswam reader. I’ve learned that Nick Thoman didn’t swim this weekend because he’s still in rehab after his injury. According to Nick Thoman. I’ve learned that Yannick Agnel has been ill in the last weeks. According to Mr Bowman. Hosszu won in 2.09. She keeps energy for the rest of the night.